From the opening seconds of Hank3’s”Country Heroes” onward, Outlaws ‘Til The End: Vol. 1 is simply one of the most invigorating records the band have made yet. More importantly, these evocative, irresistible songs have all been wholly rebuilt from the ground up, powered by the classic DEVILDRIVER sound and embellished with Fafara’s unmistakable feral roar. Outlaws ‘Til The End: Vol. 1 was produced, mixed and recorded with Steve Evetts (Dillinger Escape Plan, Every Time I Die, Sepultura, The Cure), and co-produced by DevilDriver guitarist Mike Spreitzer. The album was mastered by renowned engineer Alan Douches. See below for a full track listing and featured guests. 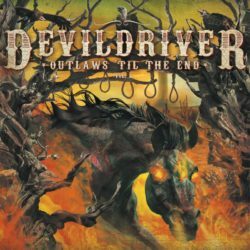 Still charging forward, proudly against the grain and on the form of their lives, DEVILDRIVER have never made a record like Outlaws ‘Til The End: Vol. 1 before. But then, nor has anyone else.The perfect marriage of badass country grit and neck-wrecking groove metal supremacy, it’sa pistol-packing game-changer delivered by true heavy metal outlaws.